Welcome to the Arts at the Armory monthly mailer, our little missive to keep you informed about all the electric and artistic goings-on happening on Highland Avenue. As the mercury begins to fall and the evenings come earlier, the calendar at the Armory promises to be as colorful as the changing leaves! Best known as a founding member of the legendary Boston act, the Pixies, Charles Thompson has recorded and performed under a number of stage names. “Black Francis” was the name he chose during the Pixies initial 1986-1993 heyday but following the group’s initial demise he chose the more straightforward “Frank Black” moniker. With the Pixies currently enjoying a career renaissance the return to “Black Francis” only made sense. What barely makes sense is how ridiculously talented a singer and songwriter he is, under any name, and his first appearance at the Armory will showcase material from throughout his varied and distinguished career. There might be no better way to celebrate the change of seasons and support a truly worthy cause than to visit Somerville Local First’s Harvest Fest. During their day (2-5 PM) and evening (6-9 PM) sessions attendees will have the chance to sample delicious food from some of Somerville’s best local restaurants, local beer from some of your favorite independent brewers around New England and much more. All proceeds benefit SLF’s operating budget to build and strengthen the local movement and local business community in Somerville all year long. Good eats for a good cause? We can’t think of much better than that, but we recommend acting fast as “Early Bird” tickets are already sold-out. Think that parking in Davis Square is frightening? Then you might not be up to the terror of the “Armory of Horror,” a fiendishly fun Halloween maze that will be sure to delight. Brave visitors can expect ghoulish villains of all shapes and sizes but only Somervillians get a discount at the door! Set your creepy grandfather clocks to ring out from 6-10PM during the last two weekends of the month! A special family day on November 1st will be held from 12-4 PM that will include fun monsters for children of all ages as they go through the maze. This month starts off Youth Arts Arise here at the Armory, a free after school education program held every Tuesday in October. The program will transition to two days a week on Mondays and Tuesdays from November 3 until December 16. Workshops take place from 3:30-5:00 PM and are available for youth ages 11-19. Each workshop will be taught by local artists who will encourage self-exploration through a variety of different themes. Youth ages 15-19 who are interested in pursuing a career in art may have an opportunity to be peer leaders and to assist the artist instructors. Spots are still available and the deadline to sign up is October 7, but please contact us after the 7th if you missed the deadline and are still interested in registering. The Cafe at the Armory, and its scrumptious culinary offerings, is truly one of Somerville’s best kept secrets. But, with continually impressive bookings like this one (part of Folk New England’s monthly series), that’s not likely to last. This month, they present Jon McAullife whose singing and songwriting has been earning rave reviews and fan praise since 1965. Along the way, he has shared stages with the likes of Emmylou Harris, Captain Beefheart and the J. Geils Band and had his songwriting prowess commended by no less an expert than Joni Mitchell. McAullife performs on October 9th, but the month is filled with lots more exciting events in the welcoming comfort of the Cafe. We look forward to your next visit! Looking forward, the Bowery Boston team will once again bring innovative musical bookings to the Armory. In November, Waxahatchee, the rootsy project of singer/songwriter Katie Crutchfield, will be here on the 6th, and psychedelic pop legend Robyn Hitchcock will bring his inimitable musical genius to town on the 12th. An early holiday treat will be provided in the form of a rare acoustic performance by the Manchester Orchestra on December 8th, and those post-holiday blues will get a solid kick in the rump when Stephen Kellogg performs on December 28th. 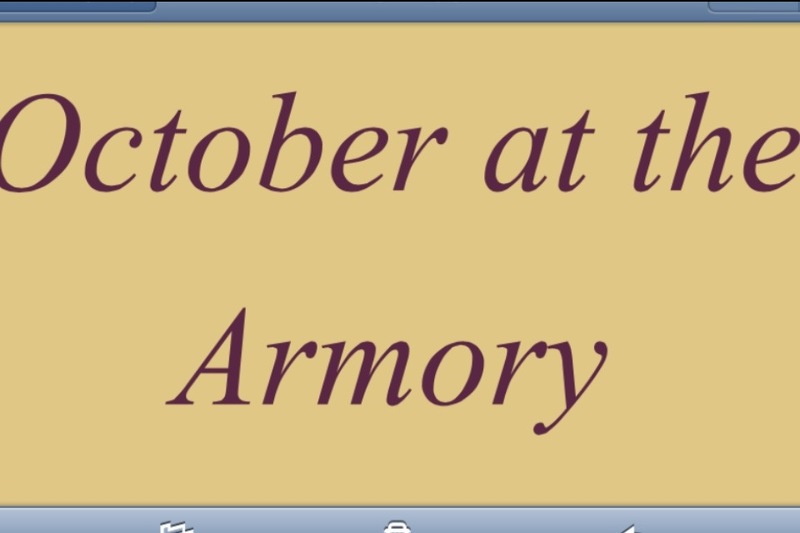 Want to hear more about what’s happening at the Armory? ​Follow us on Twitter or Facebook!